Eastern coyotes typically weigh 30-50 pounds and are 48-60 inches long, approximately twice the size of their close relative, the western coyote. Eastern coyotes have long legs, thick fur, a pointy snout, a drooping bushy black-tipped tail and range in color from a silvery gray to a grizzled, brownish red. 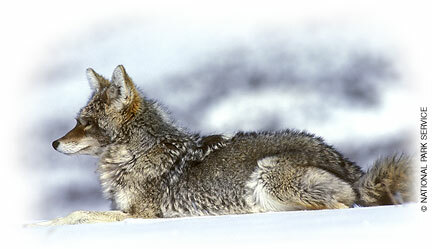 The average life span of a wild coyote is four years. Though coyotes are often mistaken for a domestic dog hybrid, recent genetic research has attributed the eastern coyote's larger size and unique behavioral characteristics to interbreeding with Eastern Canadian wolves (C. lupus lycaon). 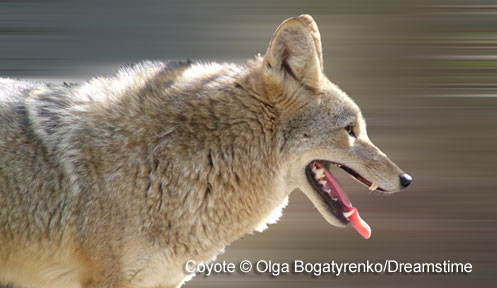 Unlike the wolf or domestic dog, coyotes run with their tail pointing down. Although the historical evidence supporting occurrence of coyotes in New England is inconclusive, no coyotes were present in the late 1800s. Since the mid-1900s coyotes have moved from the Midwestern states, through Canada and into the Northeastern and mid-Atlantic states. The first verified account of a coyote in New Hampshire was in Grafton County in 1944. Between 1972 and 1980 coyotes spread across NH from Colebrook to Seabrook. Today, coyotes are common in every county throughout the state. Coyotes are generalists, eating whatever food is seasonally abundant. Coyotes are known to feed on mice, squirrels, woodchucks, snowshoe hare, fawns, house cats, carrion, amphibians, garbage, insects and fruit. 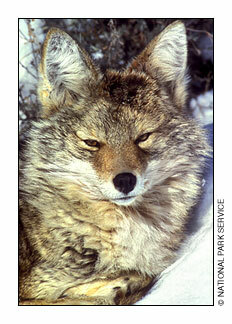 Coyotes utilize forested habitats, shrubby open fields, marshy areas and river valleys. The Eastern coyote is a social animal that generally selects a lifelong mate. Coyotes are quite vocal during their January to March breeding season. Both parents care for their young, occasionally with the assistance of older offspring. Four to eight pups are born in early May. Within a year some pups will disperse long distances to find their own territories, while other offspring may remain with their parents and form a small pack. Territories range in size from 5-25 square miles and are usually shared by a mated pair and occasionally their offspring. Coyotes mark and defend their territories against other unrelated coyotes and sometimes against other canid species. Coyotes are capable of many distinct vocalizations - the yipping of youngsters, barks to indicate a threat, long howls used to bring pack members together, and group yip-howls issued when pack members reunite. Historic research documented domestic dog/coyote hybrids, referred to as coydogs, birthing during winter months. Since male domestic dogs that manage to pair with a female coyote do not remain with the female to assist in parental care, the young rarely survive. However, recent DNA sampling of northeastern coyote tissue by Dr. Roland Kays of the New York State Museum, along with fifteen other national and international researchers, found sampled genetic material of Eastern coyote was primarily of coyote origin (82 percent), with a minor contribution from dogs (9 percent) and wolves (9 percent). Communication with a canid researcher indicates that dog genetics entered the coyote population approximately 13,000 years ago through human introduction of European dog species to North America. Coyotes are elusive, adaptive, intelligent animals that manage to hold their own when living in close contact with humans. Most coyote management attempts have been designed to reduce their population numbers, however, due to their fecundity, behavior and adaptability, those attempts have failed. The great majority of coyotes don't prey upon livestock. However, once a coyote learns that young livestock are easy prey, depredation can become a problem. If this occurs, removal of the offending coyote is often recommended. However, when farms are situated in a coyote territory with no depredation, the resident coyote may actually be an asset to the farm by removing rodents and preventing problem coyotes from moving into the area. In New Hampshire, there is no closed hunting season on coyotes and there is a five-month trapping season. Coyotes may be taken by trapping or shooting, but it is illegal to use poison as a control method. It is a good idea to check with the state wildlife agency before undertaking any control methods. Preventive measures such as proper disposal of livestock carcasses, use of guard animals, keeping expectant animals and newborns in confinement or using electric fences can deter coyotes. In suburban areas, coyotes have been known to kill house cats. Keeping your pets and pet food inside at night helps reduce the likelihood that a family pet will become prey. Coyotes are often blamed for events for which domestic dogs, automobiles or other wildlife are responsible. As for your safety, coyotes pose little risk to people. Coyote: To understand Eastern coyotes, look to their wolf relatives - by Christine Schadler, from New Hampshire Wildlife Journal, November/December 2010. Orff, Eric P. 1994. New Hampshire's Wild Canids, in New Hampshire Wildlife Journal. September/ October. Parkhurst, J.A., Coyote, a Northern New England Animal Damage Control Program Education Leaflet Series, L-680, Cooperative Extension, University of Massachusetts. 2 pp. Rezendes, Paul. 1992. Tracking and the Art of Seeing. How to read animal tracks and sign. Camden House Publishing, Vermont. 320 pp.